Workflows allow you to automate process within your organization. When a workflow is triggered from a web enabled device, text message or telephone a series of actions, which you have preconfigured will be run. Workflows can be setup to initiate outbound conference calls, send text messages, text-to-voice calls and/or polls to one or more group(s) of contacts. With workflows, you can decide to leverage all of the communication options available or just one. Navigate to 'Manage Accoun't via the Profile menu. Select 'Workflows' from the page navigation and click 'Add New Workflow'. Give your workflow a description. Incident types (ie. Fire, Flood, EOC Activation etc.) are useful as any calls placed to contacts will include the notification description in the invitation to join a call. Decide if you'd like your workflow to initiate an outbound conference call. Selecting 'Yes' will result in a conference call when triggered. Selecting 'No' will result in no call. 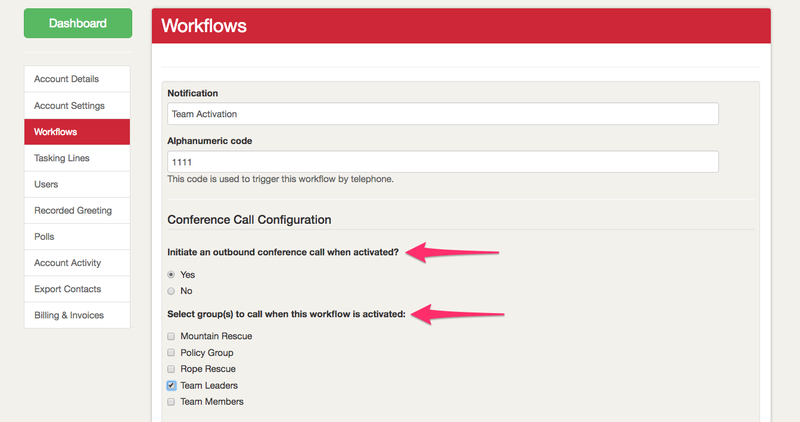 If you've opted to initiate a conference call with your workflow, select the group(s) of contacts you'd like to call. 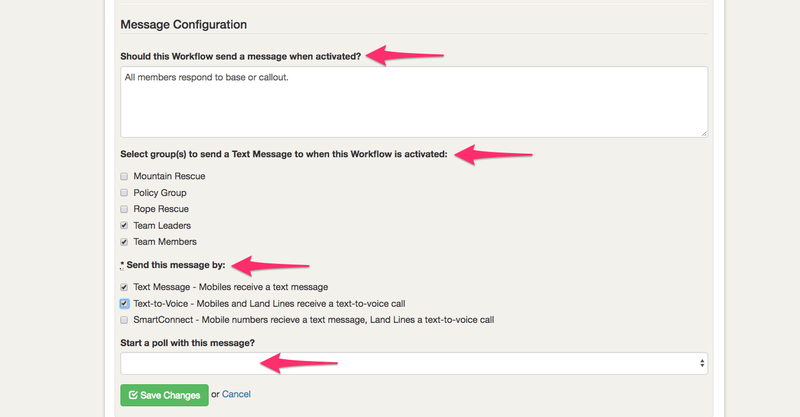 If you'd like your workflow to send a prepared text message or text-to-voice call, type your message in the text area. If you've opted to send a text and/or text-to-voice with your workflow, select the group(s) of contacts you'd like to message. If you'd like your outbound text and/or text-to-voice to include a poll, select the appropriate poll from the available options. Choose how to send your message. You can opt for text and/or text-to-voice. Once you've configured your workflow as outlined, select 'Save Changes' to create/update your settings.